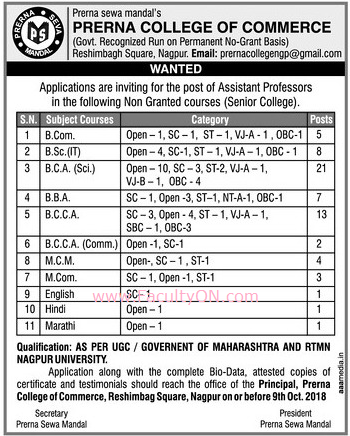 Prerna College of Commerce, Nagpur has advertised in the LOKMAT newspaper for recruitment of Teaching Faculty- Assistant Professor jobs vacancies. Interested and eligible job aspirants are requested to apply on or before 09th October 2018. Check out further more details below. About College: Prerna Sewa Mandal, one of the pioneer organisations dedicated to the cause of education from its very inception, started its operations in the year 1974. This society has successfully completed 4 decades in the field of teaching and is recognised and appreciated for its steady development, achievements in the region. The formal body of the society which came into existence in 1983, aims for an all-round growth of the institution, as all are reputed academicians. How to Apply: Interested and eligible candidates are requested to send complete CV along with attested copies of certificates and PP size photos to the postal address given below.